This app creates the sitemap.xml file for your site. It includes the main tags of sitemap (<loc>, <lastmod> and <changefreq>). <priority> tag has the default value of 0.5. App's features can be extended based on your request. The app has a setting to add intended content types and their change frequency to sitemap.xml file. It aslo adds a controller mapping to the path of sitemap.xml on the root of site. Check out Sitemaps XML format to find more about it. Fetch up to 10.000 contents for the xml. 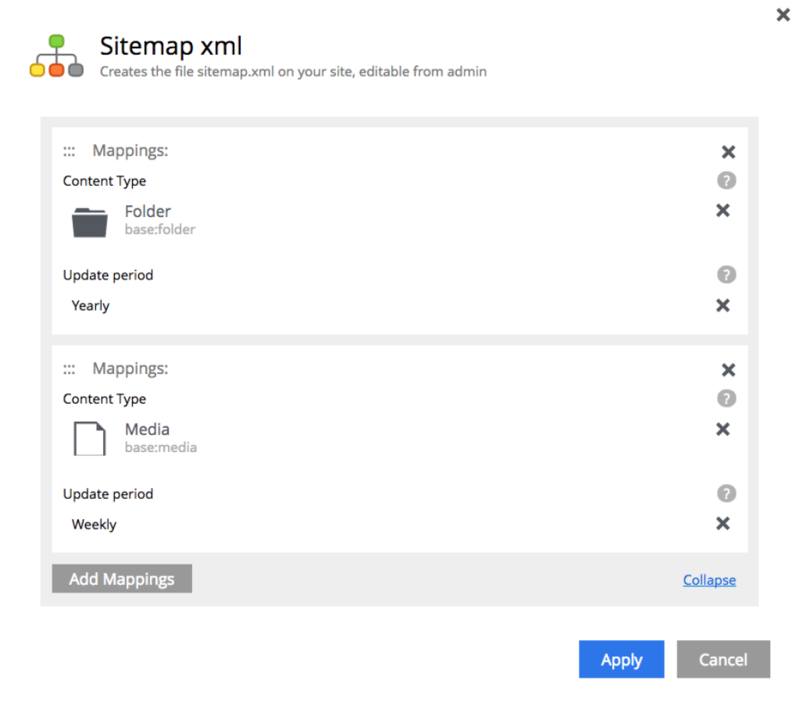 Automatically add the site content to sitemap.xml output, if not added already in app settings. Let users control priority field from app settings per content type. Only fetch content from the current site, even if mapped content types exists on other sites. If present, the robot settings from SEO Meta Fields app will be respected and used to filter the sitemap items. Bug fixed: Generate absolute URLs for <loc>-field. Bug fixed: Add missing <priority>-field (mention in the docs but not really added). Add two more options to the field <changefreq> - "always" and "never", according to specification. Upgrade wrappers and build files to Gradle 3. Get 5 days free hosted version of "Sitemap.xml" application for Enonic XP.